The La Flor De Cano Selectos is a mild, well-balanced and cheap Long Corona, 5.9” (150mm) long, of 41 ring gauge, and comes in a 25 cigars box. This is a surprisingly good cigar. It's one of the cheapest hand mades. The Selectos is characterized with subtle sweetness followed by earthy notes. It has an excellent aroma. 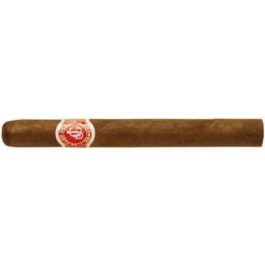 This intermediate format is the range of what we may refer to as small cigars, althouhg its ring is that of a true cigar. It has the average qualities of the brand, being easy to smoke and having good draw and combustion. Simple, but recognizable, it does not deceive. BN box of 25 Cuban cigars.